Just look at this red, ripe, juicy goodness! 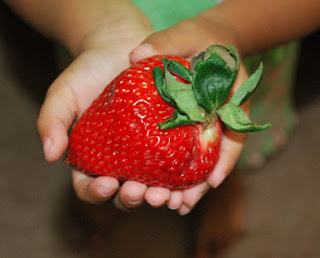 We bought these ginormous strawberries at our farmers market yesterday. Can't wait to try some new recipes! 1. Preheat oven to 375°F. Cut bread into 1/2-inch slices; arrange on a baking sheet. Bake about 10 minutes or until golden. Turn oven setting to broil. 2. Meanwhile, stir together yogurt, brown sugar, and cinnamon. Spread yogurt mixture on one side of each toasted baguette slice. 3. Broil bread slices 4 inches from heat about 1 minute or until mixture is hot. Arrange strawberry slices on the yogurt mixture. Lightly drizzle each bread slice with honey. Serve immediately. 1. Sprinkle the chicken breast halves with pepper and salt. In a large skillet, bring chicken broth to boiling. Add chicken; reduce heat. Cover and simmer for 12 to 14 minutes or until chicken is tender and no longer pink, turning once halfway through cooking time. 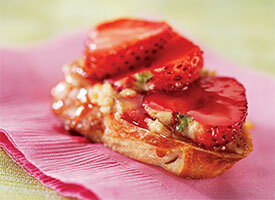 Meanwhile, prepare Strawberry Citrus Dressing. 2. Remove chicken from skillet and discard broth. Thinly slice cooked chicken. 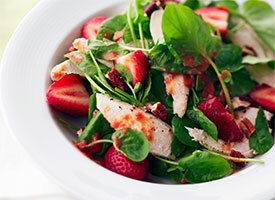 In a large bowl, toss together watercress, strawberries, and chicken. To serve, drizzle warm dressing over salad and sprinkle with pecans. Serve immediately. In a blender or food processor, combine 1/2 cup strawberries; 1/3 cup orange juice; 2 tablespoons canola oil; 2 teaspoons finely shredded lemon peel; 1 tablespoon lemon juice; 1 teaspoon sugar; 1/2 teaspoon chili powder (optional); 1/4 teaspoon freshly ground black pepper; and 1/8 teaspoon salt. Cover; blend or process until smooth. Transfer mixture to a small saucepan. Bring just to boiling. Simmer, uncovered, 5 minutes, stirring occasionally. Keep warm until needed. Makes 3/4 cup. Hottest Ticket (Invite) In The House!